The NYC Taxi & Limousine Commission, which regulates private transportation, adopted new rules requiring apps such as Uber and Lyft to pay their drivers minimum rates estimated at $17.22 per hour. The new wage is 15 percent higher than the city minimum of $15, which the commission said was needed to offset the additional costs workers face as independent contractors. The commission said companies like Uber and Lyft must share their success with the 80,000 drivers operating in America's largest city. "To reverse the trends of declining earnings and trips per driver, the rules address pay per trip as a function of both expenses and compensation," TLC said in its new ruling. "Despite economic success of these companies, reflected in the massive growth in the number of trips in recent years from roughly 42 million trips in 2015 to nearly 159 million trips in 2017, the majority of drivers have not shared in this success." "I believe all New Yorkers are willing to pay a little more and wait a little longer so the people transporting them are able to provide for themselves and their families," Joshi said in a statement to the Associated Press. "The TLC's implementation of the City Council's legislation to increase driver earnings will lead to higher than necessary fare increases for riders while missing an opportunity to deal with congestion in Manhattan's central business district," Post said in a statement. "Companies use incentives and bonuses as part of driver earnings to ensure reliability citywide by providing a monetary incentive to drivers to complete trips in areas that need them the most." Lyft voiced similar concerns that the rules would "undermine competition" and give traditional taxi companies—steadfast opponents of the ride hailing apps—an advantage by increasing labor costs. It is a further blow to the tech giants after de Blasio set a cap on the number of drivers allowed to operate in the city as part of the August legislation. "The TLC's proposed pay rules will undermine competition by allowing certain companies to pay drivers lower wages, and disincentives drivers from giving rides to and from areas outside Manhattan," Lyft said in a statement. "These rules would be a step backward for New Yorkers, and we urge the TLC to reconsider them." The commission said its new rules will boost the pay of more than 70,000 drivers. The average driver could see a raise of $9,600, a 45 percent increase, according to a TLC labor economist. The report said the new policy should come "with minimal disruption to passengers." "It's rare that the do-gooders behind new mandates acknowledge the unintended consequences, but it's remarkable to me that the commission passed it anyway, with the full knowledge of what will happen," Saltsman said. 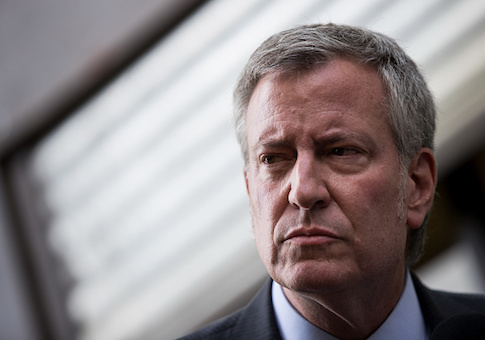 This entry was posted in Issues and tagged Bill de Blasio, New York City, Technology. Bookmark the permalink.